Sometime when all you have time for is something short and easy, a ride that allows you to spin the pedals easily and slowly, go check out the Stock Show Loop. 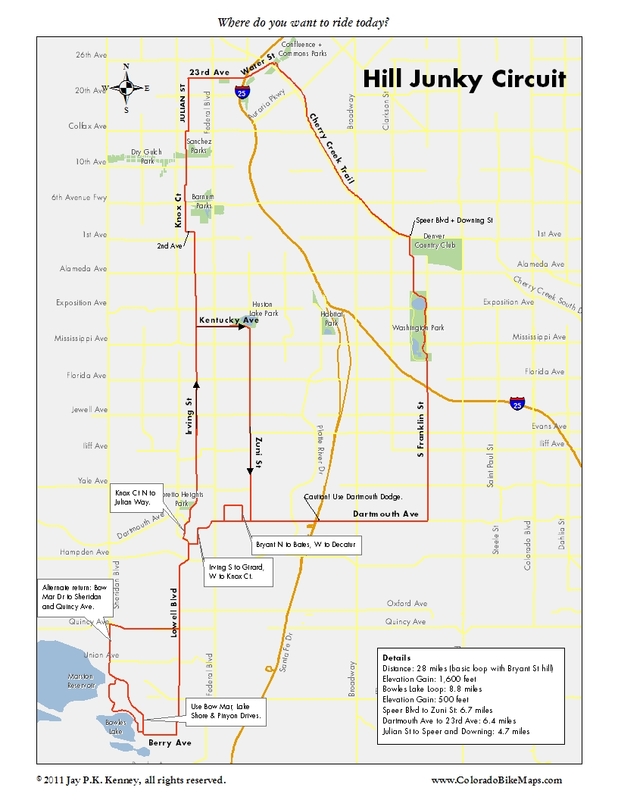 Others in this category include the Bible Park Loop, the Bryant Street Loop, and the Eisenhower Park Loop. Start on the Cherry Creek Trail. 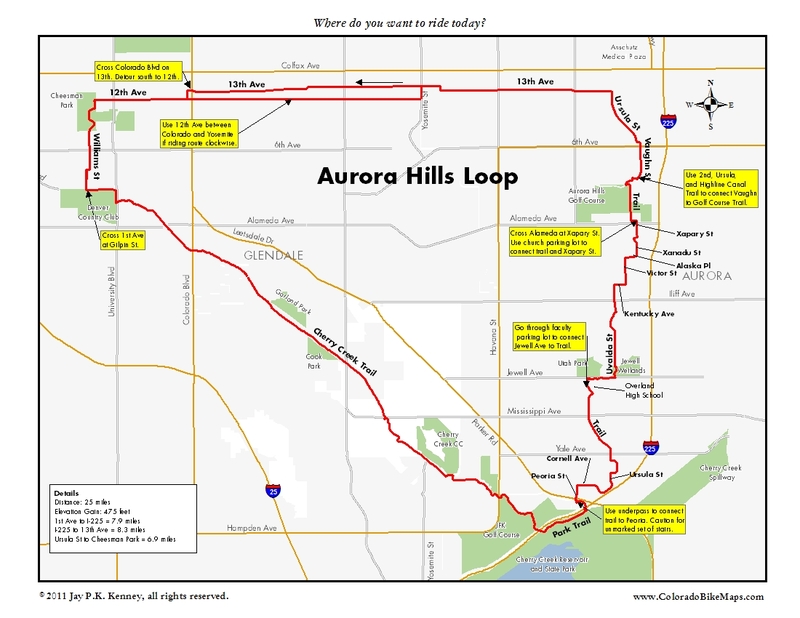 Ride to Confluence Park, then north to and through the National Western Stock Show (NWSS) complex, lately in the news because a plan’s afoot to move the show to Aurora. The show–a sort of early 20th century cattleman’s convention–has been a Denver fixture for more than a century, attracting cowboys, ranchers, bulls, and livestock to Denver during the slow month of January. The rest of the time, the complex gets used for Alpaca, cat, martial art, and music shows, judging by a recent scan of the calendar. 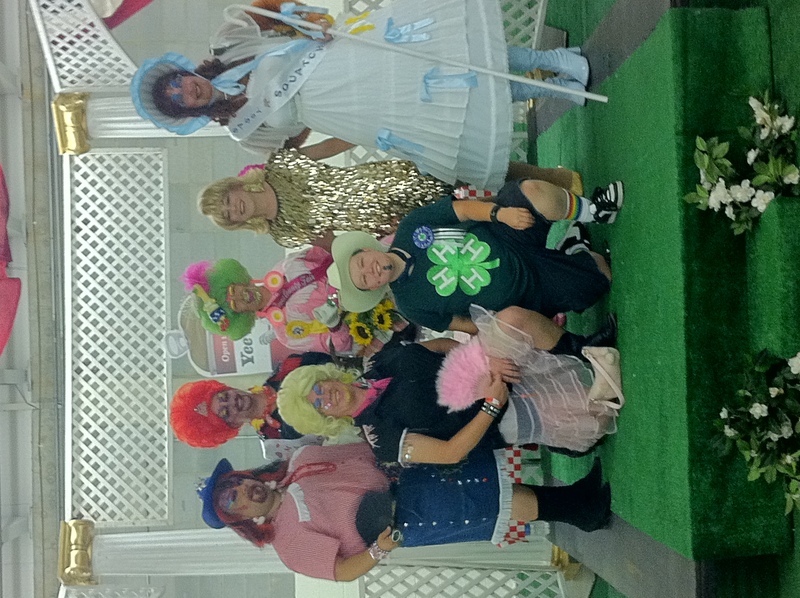 It was the recent host of the first inaugural Denver County Fair, a kind of post-modern, hipster county fair that featured a bike rode, chickens, baby goats, bees, a Goth-themed freak show, and drag queens vying for the Miss Denver County title. 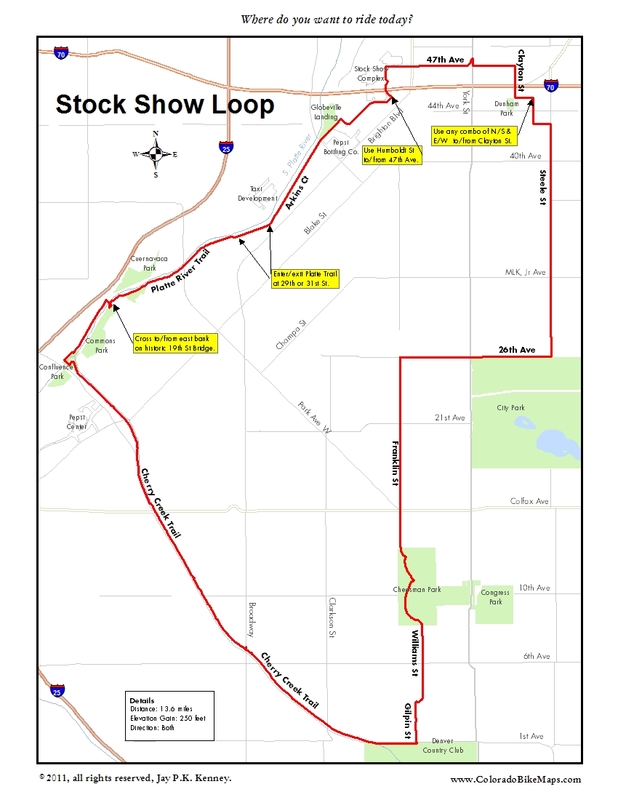 Route finding to the NWSS area is relatively easy. Head down to Confluence Park, then make your way north along the Platte River Trail to 29th or 31st Street, where you can (and should) exit to Arkins Ct. Getting through Confluence Park can be confusing, as can getting from the river left side of the Platte to the river right side. 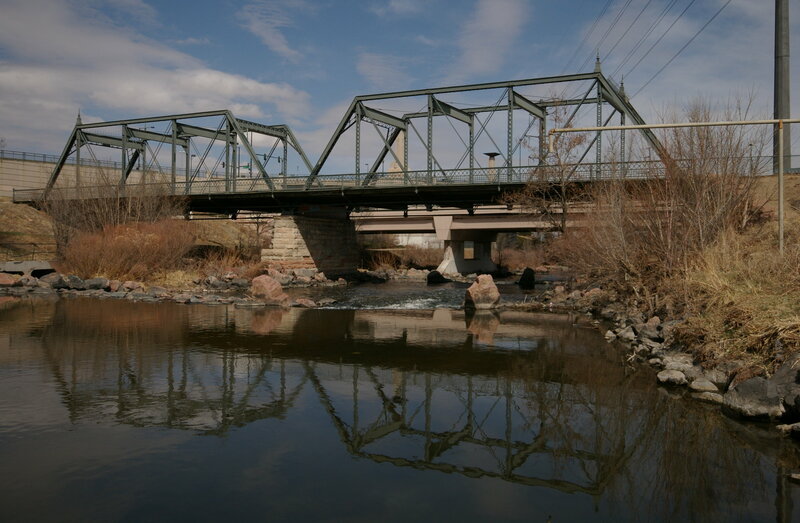 I’ve shown here the simplest approach: stay on the Platte Trail as it wends its way under 15th Street, then exit left at the historic 19th Street Bridge to cross to the other side. Exiting at 29th or 31st streets takes you away from river and the street people up to street level on Arkins Court, a surprisingly good and wide ride north to the NWSS grounds. If you need an espresso, dart across the river at 31st St to Fuel Cafe in the Taxi Development for a pick-me-up and look around. It’s a fascinating mixed use community. Follow Arkins Ct past the huge Pepsi bottling factory and through the vacant areas to the south of the Coliseum. From time to time you can get a whiff of the past as you ride through here (mostly from the Purina plant nearby), but all of the stockyards and packing plants of yore have long been closed, so you probably have to resort to the Denver Public Library to get a good sense of the original Denver Union Stockyards that lay to the northwest of the Coliseum, where 3-4 million head of livestock annually were sold and processed. Wind your way north around the Coliseum on Humboldt St to 47th Ave, then go east to York St, where a funny little jog will allow you to continue east to Clayton St. Duck under I-70 and work you way south and east to Steele St, avoiding the traffic on 40th Ave.
Steele is one of Denver’s surprisingly good cycling streets. It is wide and the traffic intensity is relatively low. Drop down to 26th Avenue and fly west alongside the City Park Golf Course across York St to Franklin St to work your way (slowly, most of the time) through the hospital district Ride through Cheesman Park, then the Country Club District to return to your starting place. 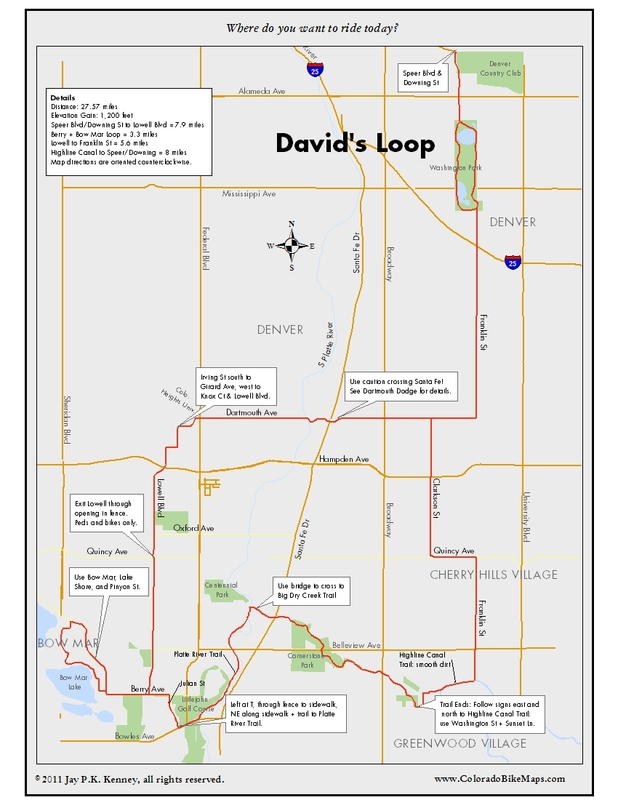 This 20-miler loops through some of the best and most interesting parts of Denver, including Washington Park, downtown Denver, Curtis Park, Stapleton, Park Hill, and City Park. You can ride it in either direction and long stretches of the streets featured have striped bike lanes. Martin Luther King, Jr Blvd was just re-striped for cycling in 2010, so get out there and show the city that you’re grateful for their work! This is a good ride anytime of day. The traffic intensity is highest during commuting hours, and lowest on the weekends. The mix of trails, streets, and protected riding is a good one for he would-be urban cyclist. The route is largely self-explanatory, but a few places need some detail. The stretch between Central Parkway on Stapleton and 32nd Ave/Quebec St is not striped for bicycles and cars there tend to be more focused on their cornering technique than on obstacles like bicycles, so use a little extra caution. With three lanes, there is plenty of room to maneuver. Between York St and 32nd St, the bike lane is intermittent. The stretch between 32nd St and the Cherry Creek Trail is slow (Stop Signs abound) but the character of the neighborhoods and people (especially through downtown) more than makes up for the lack of speed. Transitioning from the streets to the Cherry Creek Trail and vice-versa is easy once you figure out where to turn. From the Trail to Lawrence, turn left from the Trail just past Lawrence. Head upstream (SE) on the sidewalk briefly to join Lawrence at Speer. From Champa St, cross over Cherry Creek then turn right (NW) on the sidewalk along Speer Blvd SE (against traffic) a short ways to rejoin the Trail. The down ramp here that joins the Trail is a blind and sometimes dangerous intersection. Use care. Dartmouth Ave is one of the great cycling routes in metro Denver. The best of it stretches from I-25 to Wadsworth Blvd. Most of it is plenty wide for cyclists and sometimes there is a dedicated lane. It is tight at both Broadway and Santa Fe Dr. At Broadway there’s not much to be done, but Santa Fe has a decent workaround. Both the Hill Junky Circuit and David’s Loop pass through the Santa Fe Dr/Dartmouth Ave intersection. This is not a happy place to be. The light is long and the traffic intensity is high, which leads to multiple opportunities for left hooks, right hooks, and brush backs. Were that not enough, Dartmouth westbound narrows down from two lanes to one as you approach Platte River Dr, adding additional pressure on the unwary cyclist. It can be fun sometimes to try to time it exactly right, but most of the time the Dodge is a better alternative. From Denver look for the start of the trail at the Dartmouth + Inca St intersection. Use the turn lane. 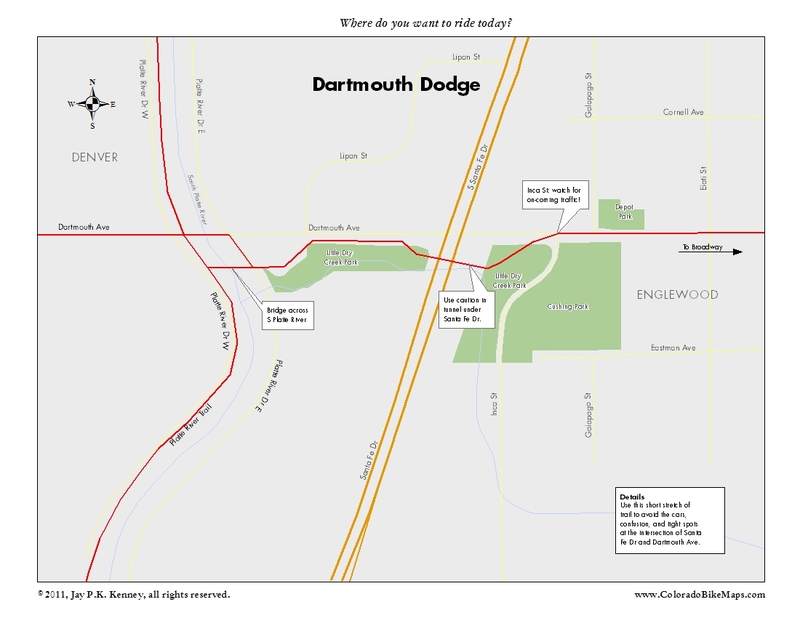 From the west, pick up the trail on Platte River Dr E, just south of Dartmouth and linking up with the bridge from the Platte River Trail. 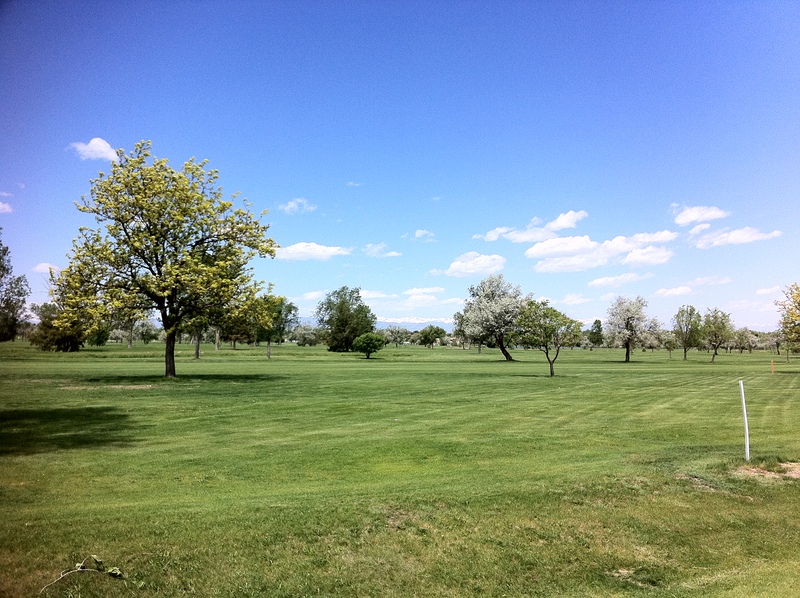 This southwestern loop is approachable from multiple directions and covers a huge range of terrain and scenery, from the gritty stretch along Dartmouth to the meticulously maintained lawns of Cherry Hills. 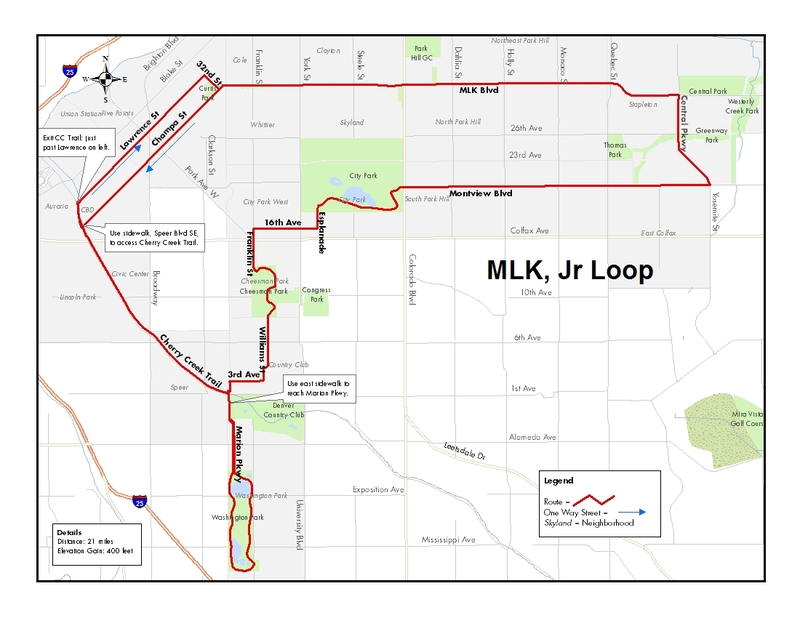 You can start it from Washington Park (shown), from the Highlands (Lowell and Irving St), from southwest Denver (Dartmouth Ave), from the south (Platte River Trail) and from the southeast (Quincy Ave). As shown, the route begins with a 5-6 mile warm-up from Washington Park, then heads west along Dartmouth where you’ll encounter your first climb. Make a small detour at Bryant St if you want to intensify the climbing. After passing Loretto Heights, go south to the steep hill at Berry Ave, passing through a bike/peds only gate on Lowell at Quincy. 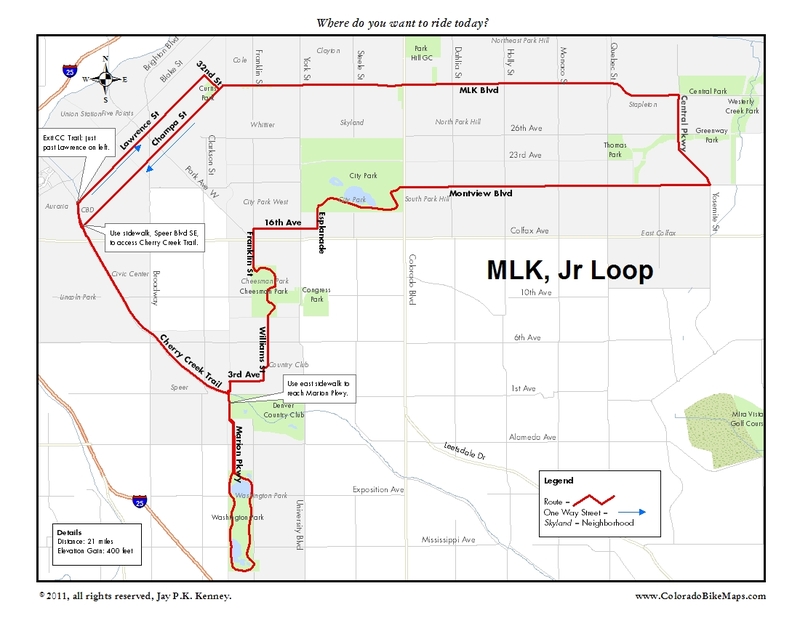 Loop Bow Mar and find Julian St to take you south to Bowles Ave. A bit of cycling legerdemain will take you you east from Julian along a sidewalk and bike path to the Platte River Trail. This is the only slightly tricky part of the route: Where Julian seemingly angles sharply west look for a sneaky left through a fence onto a sidewalk. It will lead you along Bowles, across Federal Blvd and to the Platte. From there, head north to Dry Creek Trail then east, gradually uphill through a series of interconnected parks to the Highline Canal Trail, a short bit of very good dirt that brings you to Franklin St. Pay attention as Dry Creek Trail ends. Ride north on Washington, east on Sunset Ct, and follow the brown and white signs to the Highline. The trip north on Franklin takes you through the very large and sometimes quite beautiful homes of Greenwood and Cherry Hills Village. The street is ultra-quiet an shaded. A short stint west on Quincy then another north on Clarkson through the medical district returns you to Dartmouth. Cautions: Avoid the intersection of Dartmouth and Santa Fe. Use the bike trail that begins at Inca St to dodge around to the S. Platte. The intersection of Knox Ct and Hampden Ave is not always cyclist-friendly if no cars are going in your direction. Use the pedestrian crossing if you need to. Crossing Belleview at Franklin St can be challenging, depending on the time of day. This is one of my favorite west side rides. The multiple hills keep it interesting. The traffic is generally light and friendly, and the sights and sounds entertaining. Multiple laps of the core rectangle are possible and you can stretch the ride out with excursions out to Garrison St in Lakewood. Stops signs, none of which come at really bad times in the climbs/descents, are the only real buzz killer, but weekend traffic is light enough that foot-on-the-ground stops are rarely necessary. The core of this route runs from the Denver Aquarium to the north and Bow Mar Lake in the south. In between, and along the way, are a multitude of hills. None are very long, a few are quite steep, and the route makes a fine training ride and offers a mid-winter alternative to Lookout Mountain and the standard foothill rides. From both east and west there are two easy approaches, along Dartmouth or 23rd Ave. Many variations and extensions are possible, but I like to start in the north, work south along Irving then jog east to pick up Zuni St at Kentucky Ave. There are significant hills southbound between 13th and 6th Ave, as well as multiple hills along Zuni south of Huston Lake Park to Dartmouth. Don’t miss the short but very steep sections on Bryant St and a few miles later on Berry Ave, both of which jump up into the low to mid teens in slope. Sneak through a bikes/peds opening in the chain link fence at Lowell Blvd and Quincy. A short rolling stretch through the quiet Bow Mar neighborhood allows you to return along Berry and Lowell or exit north to Sheridan and Quincy Ave. Heading north, you’ll encounter another good climb from Hampden to Amherst Ave, along Lowell, Knox Ct, and Julian Way, all of which resolve into Irving St again. Finish the core climbs with short sprints between 2nd Ave and 6th Ave, and then again between 12th and 14th Ave. Cautions: Between Julian St and Knox Ct, you’ll be on Colfax Ave in the turning lane for 1/2 block. It is a school zone, but it is still Colfax Ave. If you approach from the southeast along Dartmouth, avoid the intersection at Santa Fe Dr by using the bike trail to the south between Inca St and Platte River Dr. The intersection at Lowell Blvd and Hampden Ave can be difficult if no other cars are around to trigger a signals sequence friendly to cyclists. Use the pedestrian button if you need to.